Researchers published a batch of controversial studies on bird flu on Thursday, demonstrating that H5N1 is still dangerous to humanity and closing a chapter in a still-evolving debate over censoring scientific research. Commentaries questioned the wisdom of an unprecedented U.S. government request to delay the research, while experts debated whether it was too dangerous to make public. One cyberexpert said that experience with hackers shows it’s likely a waste of time to try to delay or limit such experiments. The studies, published in the journal Science, demonstrate that only a few mutations could transform H5N1 bird flu into a version that is easily passed through the air from one animal to another--and, by inference, from one person to another. The research used ferrets, the animals that most closely resemble human beings when it comes to influenza. They show these mutations not only can occur easily in nature but that some already have. Reassuringly, the ferrets did not die and the mutant viruses were treatable with existing flu drugs. “We now know that we're living on a fault line,” Derek Smith of Cambridge University in Britain, who worked on one of the studies, told reporters in a teleconference. The researchers said their findings show that the benefits of such experiments far outweigh any risks. And one flu-vaccine expert said that the findings demonstrate the need for regulators to make it far easier to make flu vaccines fast so they can be distributed quickly enough to avert a pandemic. “It's our hope that [Thursday’s] publication will help to make the world safer, particularly by stimulating many more scientists and policymakers to focus on preparing defenses,” Bruce Alberts, editor in chief of Science, told the teleconference. 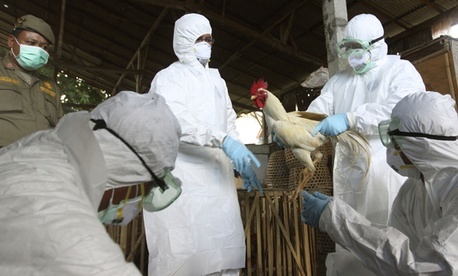 H5N1 bird flu has killed nearly 60 percent of nearly 600 people reported infected since 2003. It mostly kills chickens, but experts believe that H5N1 could cause the next big deadly pandemic, such as those that struck in 1918, 1957, and 1968. Luckily, the infection doesn’t spread well from birds to people or from one person to another. But like all versions of the flu virus, it evolves and mutates in several different ways. Scientists have been working for years to figure out just which mutations would allow H5N1 to spread easily from one person to another. The work concerned some experts, and last December the National Science Advisory Board for Biosecurity asked two teams of researchers to hold off on publishing their findings. The U.S. government also asked all flu researchers to agree to a moratorium on genetically changing flu viruses until ground rules could be agreed on. The worry was that the virus could escape and accidentally cause a pandemic or that terrorists could somehow get hold of the work and use it to make a biological weapon. But the restrictions caused a furor among researchers, who are used to freely sharing their work. The biosecurity board agreed earlier this year to let the researchers publish their findings. Dr. Anthony Fauci, head of the National Institute for Allergy and Infectious Diseases, said that the benefits of the work outweighed any risks. NIAID, one of the National Institutes of Health, helped pay for both H5N1 studies. And cyberexpert Bruce Schneier of BT Managed Security Solutions in Minneapolis said that it does little good to try to keep such research secret. “First, security based on secrecy is inherently fragile. The more secrets a system has, the less secure it is,” Schneier wrote in a commentary in Science. “A door lock that has a secret but unchangeable locking mechanism is less secure than a commercially purchased door lock with an easily changeable key,” he added. The researchers say it’s now important to do a better job of monitoring for H5N1 mutations in people, chickens, and other animals. Dr. Rino Rappuoli, global head of vaccines research for Novartis Vaccines and Diagnostics, also asked regulators to change the rules to make it easier to make vaccine quickly in case of a pandemic. He pointed to failures in the 2009 pandemic of H1N1 swine flu, when it took so long to make and distribute vaccines that the pandemic had peaked before most people could be vaccinated. And poorer countries missed out altogether. The United States would have to loosen its reluctance to use vaccines that have additives called adjuvants, Rappuoli said. They are widely used in Europe but U.S. regulators have been more conservative, meaning doses of U.S.-licensed vaccine don’t go nearly as far. He also asked for regulators to loosen restrictions on the basic ingredients of vaccines, freeing makers to use DNA sequences alone to reformulate flu vaccines and to use cell cultures instead of the current, decades-old technology of injecting virus into eggs and spending weeks growing it to make vaccines.